Velocity Ultra was a bit of a sleeper indie hit on the Playstation Network last year, and today sees the release of its much-anticipated sequel Velocity 2X. 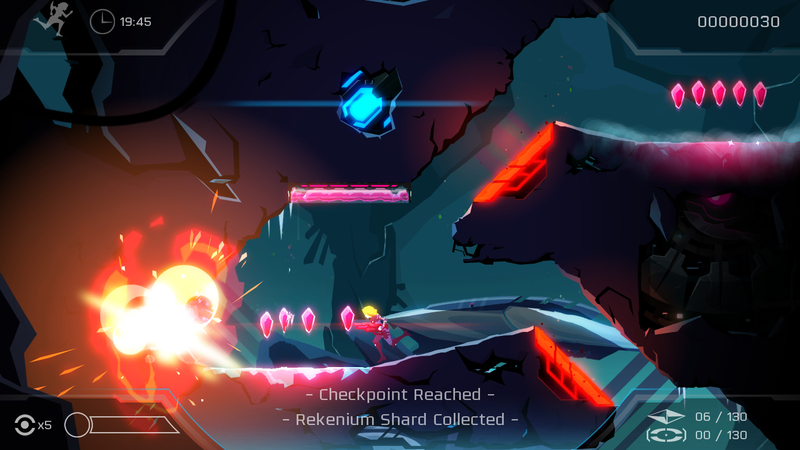 Whereas Ultra innovated with its unique hybrid of shoot ’em up gameplay and puzzles involving teleportation, 2X expands upon this template by bringing in a brand new dynamic: side-scrolling platforming. The transition between shmup action and platforming is seamless, and it tactfully brings together two genres that you normally wouldn’t think of combining. The vertical shooting mechanics are the same as before. You control a decked-out shapeship known as the Quarp Jet, which is built for both speed and combat. Its initial loadout comes with the ability to use turbo boost and rapid fire bullets. After a handful of missions, the jet gains access to bombs which can be dispersed in the four main directions, as well as the teleportation element — the crux of the game. 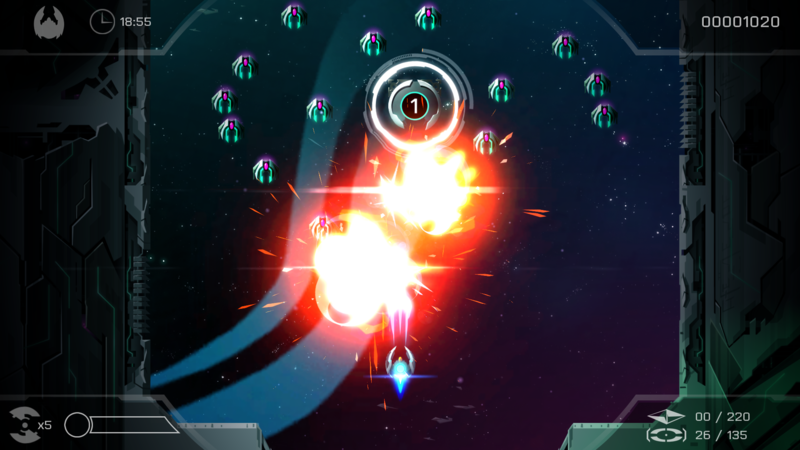 By aiming the left stick and pushing the square button, your ship can teleport to previously unreachable areas. This is easily the most used function in the game, as it is the only way to get past walls, barricades and other obstacles in your way. As the game progresses, new uses of the teleporter are discovered, including the ability to drop a telepod and then return to it at any point. Using the telepods is crucial to accessing everything the game has to offer, as it will allow you to return to previous points and then take a different route to your objective. This element adds a sense of exploration to what initially appears to be a straightforward shooter. The teleporter takes some getting used to, especially once you start dropping multiple telepods in a level. The constant back-and-forth traveling breaks up the speed of the gameplay, sometimes to its detriment. A handful of levels get a bit too complex by forcing you to hit different colored switches in the correct order, requiring multiple stops-and-starts. These seem counterintuitive to the otherwise fast-paced action. That being said, I absolutely loved coming across the gateways that send you into the side-scrolling platforming areas. As mentioned earlier, these transitions are flawless, and it’s remarkably easy to go from top-down shooter to a side-scroller thanks to the same responsive controls found in both styles. In the platforming sections, you control the pilot of the ship, Lt. Kai Tana, as she runs, jumps and shoots her way through each area. These sections are similar in that you take down enemies, hit switches and collect crystals. Most of these areas are relatively short, and once complete you just hop back in your ship and continue through the level. Although they are definitely similar in tone, the addition of platforming is much-welcomed and it adds a bit of variety to the main campaign. Speaking of which, the campaign has a ton of content available. There are a total of 50 levels, and they are designed to be replayed. Each level has time limit goals, crystals and survivors to pick up, and you get more points for hitting all three. Gaining “perfect” ratings on each level is particularly rewarding. Also, there are all sorts of special items scattered through the campaign’s missions, some of which even unlock bonus levels that are unique puzzles in their own right. After playing Velocity 2X for the first time, I went back to Velocity Ultra to compare. The improvements are staggering. 2X is a major step-up in terms of visuals, with the game moving at 60 frames per second on both PS Vita and PS4. This is one slick-looking game, and the expanded techno-based soundtrack suits it perfectly. The only thing that is a bit of a downgrade between the two games is that 2X has some noticeable loading times when starting a level. These moments are very brief and assuredly not an issue, but the levels do not load instantaneously like in Ultra. Of course, this makes sense, given how much more the sequel has to offer. I’m not sure Velocity 2X quite fits the “game of the year” label that was being touted before release, but it is a damn good sequel that expands upon the original in the best ways possible. My occasional issues with the stop-start mechanics are fairly minor, as the game still captivates with its addictive bite-sized levels. 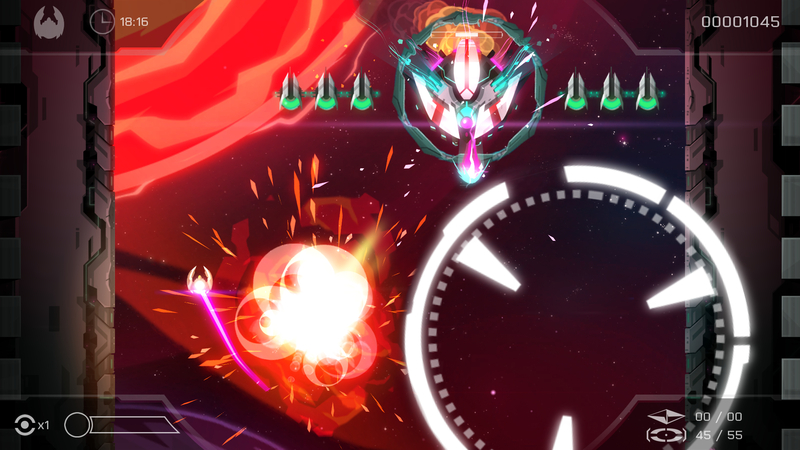 If you enjoy shoot ’em ups and/or platformers, there’s a very good chance you will fall for Velocity 2X.